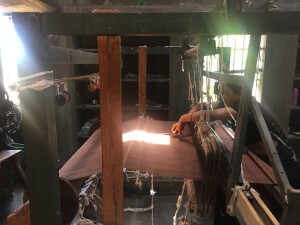 TÜLA has joined hands with Janapada Seva Trust in Melkote village of Mandya district of Karnataka to ensure that the desi cotton yarn handspun skillfully is then dyed with natural colors (that too Only to the extent needed, while most of the fabric is also kept unbleached and undyed) and that the same is woven into fabric. Supervised by "Master weavers" ,the effort here is to support livelihoods of weavers and make it attractive for a new generation to learn this skill and art. This is a unique way by which yarn in 2 direction (warp and weft) is interlaced to produce fabric/cloth. 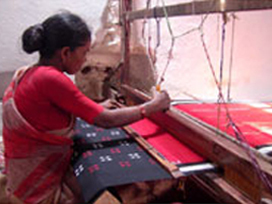 The weaving is normally done with a hand loom- a specialised machine to intricately weave the yarn in to fabric. This is also a traditional art with so many variations with different areas having some specialty styles (ikat, varanasi,kanchi, etc) which needs to be supported and brought back. The power looms are huge machines, industrial process that takes away lots of livelihoods and a very eco-unfriendly process. The power and other resources sucked up by power looms is way too high and hence very unsustainable. Unless the urban India and the new India patronises these hand spun and hand woven fabric and garments, these will be lost soon. Tüla ensures the "Artisans are paid" well enough to have a decent livelihood out of this hand weaving. Note: Khadi is any fabric that is both hand spun and hand woven. As the Britishers were going industrial and hence taking away livelihoods as well as raw cotton to Britain and producing clothes with machines, Gandhiji started the swadeshi movement and insisted on khadi being used and promoted heavily. Thus Khadi became a symbol of sovereignty and our freedom struggle. Today to ensure enhanced livelihoods and to revive this struggling art and also to bring back a great tradition, we urge you all to support Khadi- hand spun and hand woven garments. The next step after the hand-woven fabric is ready is to then stitch the TÜLA garments into attractive and comfortable kurtas, shirts, kurtis, kameezes, women's tops, kids wear etc. The patterns are designed by Nature Alley's Tara Aslam and other designer volunteers, and tailored into garments in Chennai, Melkote and Bangalore.